This traditional Donauwellen recipe, translated Danube waves cake, is layered alternating with vanilla and chocolate cake dough, sour cherries and vanilla cream. After the cake is baked and cooled off a chocolate glaze is applied to the top of the cake and waves are made using a fork. When the cake is cut in squares it sure looks like the waves of the Danube river from the side. 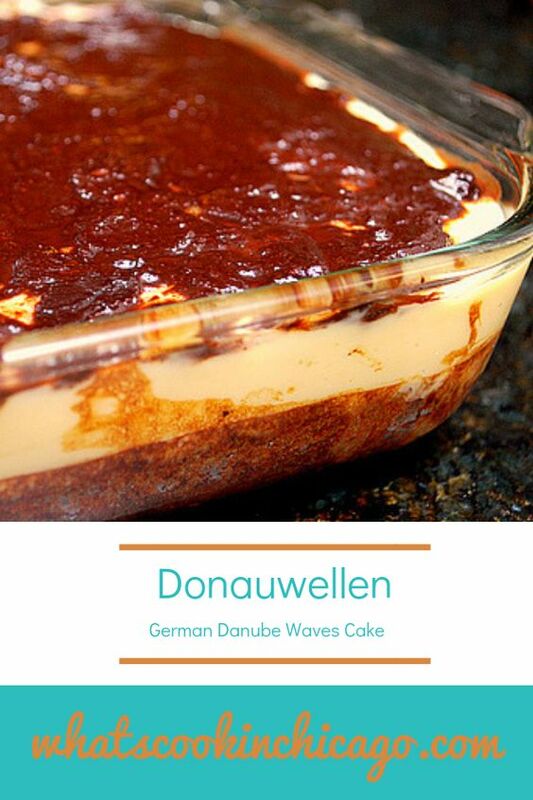 The 'Donauwellen' cake looks very elegant and tastes great with the different flavors. Combine butter, sugar, pinch of salt and eggs, and mix until creamy. Mix the flour with the baking powder and fold to the batter. Mix everything together then divide the mixture in half. Mix 2 tablespoons cocoa powder with 2 tablespoons milk and add to the one half of the dough mixture, combine by mixing until all is blended well. Drain the sour cherries in a sieve. 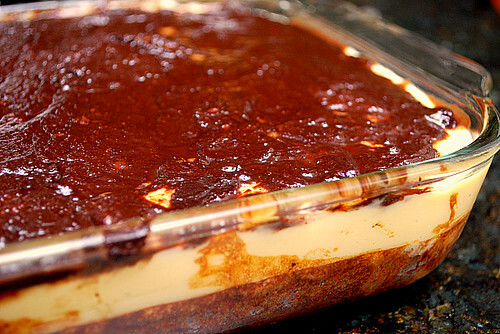 Mix the pudding powder with a little of the cold milk. Bring the remaining milk with the sugar and a pinch of salt to a boil, add the pudding powder, bring to a boil again, stirring continuously until thickened. Pour the pudding into a bowl and cover tightly with plastic wrap, let cool at room temperature. Mix the powdered sugar with the remaining butter. Fold the cooled pudding one spoon at a time into the butter mixture. Spread the cream evenly on the cake. Refrigerate. Chop the chocolate and let melt in a double boiler. Heat the coconut fat and add to the melted chocolate mixing it until it looks glossy. Spread over the cake and make wave pattern with a fork. Let chocolate harden. Sieve the cocoa powder with powdered sugar over the cake. Cut the cake in squares. Whip the cream and decorate one tab on each square, top with a cherry. Like the traditional Donauwellen recipe. A combination of Chocolate, cherries and custard is really a winning combination. Wish if I could taste it while going through your blog. Enjoyed it very much. What is coconut fat and is there anything I can sub for it? Fey - you can find coconut fat at ethnic groceries but can cub it with shortening.